For the past fortnight I’ve been living with one of Alienware’s Alphas to see what it’s like having a primordial Steam Machine hooked up to my television. I wanted to know how well it played games, whether I could control the whole thing without a mouse and keyboard, and just how well Steam worked as a console interface. Essentially, is it worth getting a Steam Machine now or wait until their official launch in November? It’s been a frustrating two weeks. 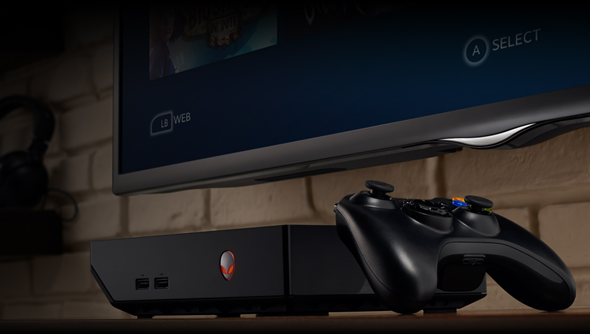 Alienware designed the Alpha to be in the first wave of Steam Machines, Valve’s living room computers that could take the place of the console under your television. On paper they’ll give you access to your full Steam library from the comfort of your sofa. However, delays to the release of the Steam controller and Linux-based SteamOS, pushed Alienware to release the first iteration of the Alpha running Windows 8.1 and supporting the Xbox 360 controller. The Alpha feels like a halfway step. 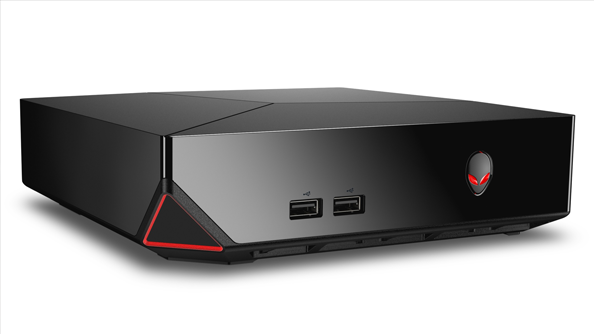 Alienware sent us their basic version of the Alienware Alpha. £450 in the shops, it comes with an Intel i3 processor, 4GBs of DDR3 RAM, and a bespoke 2GB version of the GTX860M graphics chip. The M series was originally designed to power laptop gaming, architecturally it’s identical to the Geforce GTX 750 Ti, one of the first generation Maxwell graphics chips. It’s a powerful graphics chip and one that draws very little power – using only a 130W. That’s a little more than the Xbox One’s 120W and a little less than the PS4’s 140W but significantly less than a gaming desktop. If you want to spend more you can improve almost every element of the machine, switching out its 500GB hard drive for a 2TB alternative or doubling its RAM to 8GB. The most effective upgrade would be replacing the i3 with either an i5 or an i7. Although, these upgrades are costly. The top range Alpha will set you back £700. The 860M is the only component of the Alpha you can’t upgrade. Alongside the consoles, on paper, the Alpha looks like a serious competitor. It’s smaller than both machines, only 20cm x 20cm x 5cm in size (about the size of a router), and can play Metro: Last Light at a higher resolution than the Xbox One. It also has a much larger catalogue of games, letting you play everything available in the Steam Store. It’s a looker, too, Alienware’s continued their tradition of making their machines look like the child of a stealth fighter and Nolan’s batmobile, so it’s all hard, angular lines and black plastic. The Alpha boots up silently when you press in the iconic alien face boot button, and the startup process is accompanied by a set of neon lights – you can change the colour of them, too, so right now I’ve a bright pink glow under my TV. The hardware isn’t the problem. It’s the software: namely Windows, and it’s requirements for a mouse and keyboard, that dents Alienware’s ambitions. 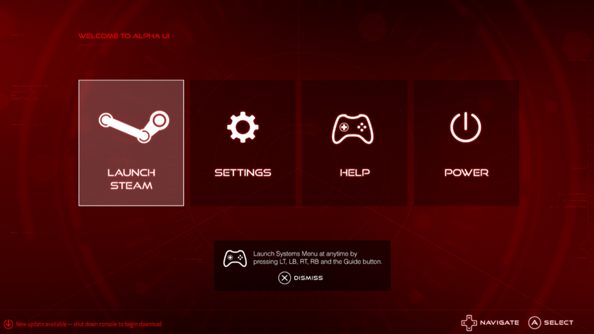 When you first turn on the Alpha, you enter a menu in which you can choose to boot to the desktop, or launch Steam’s Big Picture mode. Using just the Xbox 360 controller provided, you’re able to navigate through the settings menu and connect to your Wifi. It’s just a simple button press to boot Big Picture mode. 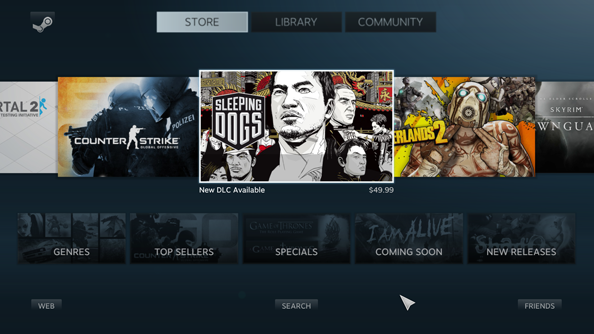 Valve’s television client gives you access to all the same sections of the desktop client you’d want – the store, community hubs, and your library are all there. It was easy to find and install Metro: Last Light. It was a little bizarre to see Steam go through the same installation procedure as on desktop, running through the first time setup of DirectX. The Windows-style system box popped up, a reminder I was using a PC not a console to play Metro. Metro ran surprisingly well. I had the graphical settings on low or turned off but I was able to play it at 1080p at a steady 30fps+, a higher resolution than the Xbox One. Even on low settings, Last Light’s an excellent looking game. It ran well right up to the moment the game crashed to the desktop. And I mean to the desktop. I was dumped unceremoniously onto the Windows 8.1 desktop. I couldn’t use the 360 controller to navigate the screen to reboot Steam, instead I had to plug in a mouse to continue. This is the real issue with what Alienware have built. My problems with the Alpha aren’t necessarily technical. They’re entirely functional. PC gaming requires a mouse and keyboard and it’s entirely unrealistic to expect users to live without one. For example: to play Assassin’s Creed I had to sign into Uplay using a mouse and keyboard. For example: despite Steam claiming it was entirely playable with a controller, I couldn’t change my character name in One Way Heroics without a keyboard. For example: to run Netflix in the Steam Browser I had to first boot to Windows from the Alienware interface and install the Netflix App through the Windows Store. For example: to dismiss error messages in Alan Wake I needed to plug in a mouse. For example: a technical issue meant I had to go to the SteamApps/Common folder in Windows and boot Hotline Miami 2 with administrator privileges using a mouse and keyboard. The simple explanation: a PC is a PC. It’s not a console. The thing we love about PCs; their flexibility and openness gets in the way of a living room experience. I wanted to treat the Alpha like a console, but I’d repeatedly be forced to plug in a mouse and keyboard. At times the Alpha worked flawlessly, I spent a Saturday morning running through Towerfall without a single issue, but whenever I installed a new game I’d no idea if it would work out of the box or if I’d have to plug in the peripherals and start tweaking files in Windows to get it working. Then, there’s a question over the machine’s raw capability. Here’s a depressing fact: it can’t run Call of Duty: Advanced Warfare. The Xbox One I have sat next to it can run the game comfortably. That console is £150 cheaper, has slower RAM (though more of it), a weaker GPU and CPU, and yet runs Advanced Warfare at a steady 30fps. I tried to sidestep the hardware limitations using Steam In-home Streaming. That came with its own host of problems. The Vanishing of Ethan Carter wouldn’t let me control the game through the Alpha, essentially just showing me what was going on on my desktop monitor; Alan Wake’s audio was drowned out by the sound of microphone feedback (which, I’ll admit, was appropriately spooky); Call of Duty: Black Ops 2 played the audio through my desktop speakers instead of the television’s; Crypt of the Necromancer worked perfectly except it sounded like the television’s bass emitters had been cracked, making them buzz distractingly on every low note. Eventually I got a few games to work exactly as they should but their success was random. I can’t trust that they’ll work fine in future. Other times I couldn’t use the machine because of bugs. The Alpha wouldn’t detect my controller on boot, forcing me to restart the machine until it could discover it. When I tried to buy a game through the Steam Store Valve’s typing interface became stuck, blocking my view of the screen, forcing me to reboot. Uplay kept rebooting the Alpha when I tried to start Assassin’s Creed. These problems aren’t all the Alpha’s fault, many are issues with Steam and Windows, but they prevent the Alpha from being a useful living room machine. If you compare the Alpha to current generation consoles it just can’t compete. They’re cheaper, more robust, and more versatile. Despite the Alpha being a PC and able to do everything a PC can, the interfaces available are rubbish at enabling that. Steam’s good for games but can’t stream video from Netflix, play music from Spotify, or let you Skype people. Windows 8.1 lets you do all that but you have to plug a mouse and keyboard into the machine and treat it like a desktop PC. The good news is that a lot of those features are likely to be on their way with the full release of the SteamOS this November. The Steam Controller, too, should make navigating any desktops a cinch, thanks to its laptop-style touchpads. But they’re not here yet and until they are it would be a mistake to buy an Alpha as a console replacement. 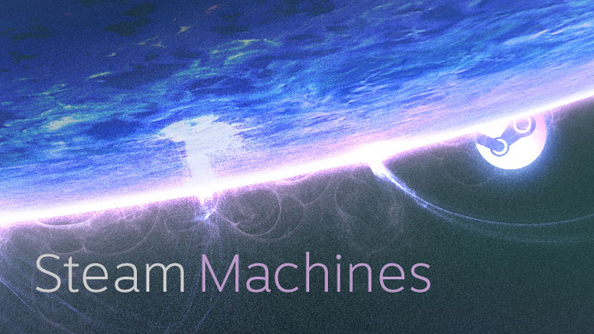 If Valve want their Steam Machine’s to work when they launch this November, they have to iron out these problems. It’s not the hardware that will define the success of their initiatives: it’s the software, stupid.